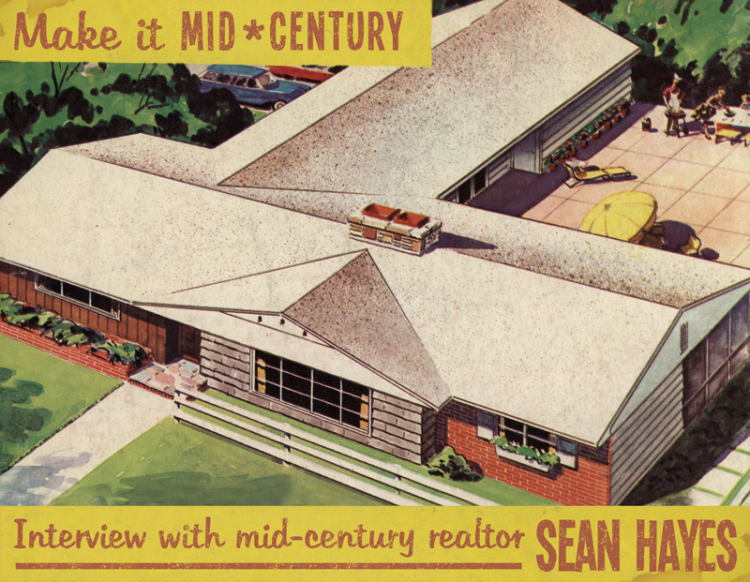 We're starting a new, periodic blog post, reaching out to Realtors who specialize in mid-century properties. We'll be asking questions of Realtors across the United States to see what's the same or different in various part of the country. Today we're starting close to home, with an interview with Sean Hayes, of the Hayes Hometown Team with Coldwell Banker Premiere Group. Sean Hayes, Hayes Hometown Team with Coldwell Banker Premier Group. I have been a realtor for 13 years in the St Louis area. They have been a passion of mine for quite some time. About two years ago, I realized there was a void in the local market that needed to be filled, and I took action to provide mid-century homeowners and buyers with a resource, for when it comes time for them to make a move. My passion for the style. When you are passionate about something, it shines through. I heard stories from those searching for mid-century homes and those selling them, that the typical Realtor, just did not "get it." They always talked about ripping out original features, and it was tearing at these client's hearts. The mid-century enthusiast deserves someone who will listen to their wants and help them bring them to fruition. I do work with many different styles of homes and clients with varied interests. I am currently only licensed to handle residential properties but have great connections and partners in the commercial world. Mid-century architecture tends to range from 1950-1973. Prior to that, the post WWII boom had not quite embraced the style yet and in the mid 70's homes become more straight lined boxes, rather than angular pieces of art. It did have a stronger presence earlier on, in different locations, but here in the midwest and St Louis, these are the years we tend to see the design elements most of us associate with the style. It is a growing community. Many of us are still in the dark about how vast the community truly is in the area. I meet new enthusiasts all the time and I have many people, who are not enthusiasts, who say if it wasn't for my social media they wouldn't even know what mid-century modern was all about. As more millennials start to purchase homes, they are scooping up these great homes. We have several subdivisions in St Louis County that are must-see mid-century modern communities. The majority of them have active neighborhood groups that allow everyone to come together and not only share their passion for the style but also allows them to create great neighborhoods. We are also seeing a trend, that since there are only so many mid-century modern homes available, mid-century ranch homes are being purchased and retrovated into atomic ranches. Specific, maybe not, but we see a lot of the details that are associated with the style. Such as low pitched angular roofs, triangle windows, beautiful use of wood, brick and limestone materials, and what I consider one of the greatest features, the marriage of the indoor and outdoor spaces. The oneness of mid-century modern design with nature is truly one of the best accomplishments of the movement. Although, I guess our use of brick around here is a usual detail. St Louis has always been known for its great brick. The dirt around here is perfect for making bricks that are now being sold off, as our historic buildings are torn down, to other parts of the country for different construction projects. The typical range is $190,000-$350,000. There is one community that does have some homes available in the $140-170,000 range. When we get into the larger estate-style mid-century homes, typically designed by Bernoudy, or some Fournier and some Harris Armstrong designed homes, the range can be from $700,000 to over a million. There isn't a demographic in the traditional sense. You can not say oh they are a married couple, no children, with X range of income. The best way to describe them is as fun and passionate. Most of the mid-century enthusiasts I run into are very outgoing, gregarious people. I think that is an extension of how well suited these homes and the perception of the lifestyle leads to entertaining. Think a classic 1950's cocktail party. Most of the people I know would easily fit into that situation without any effort or having to go buy a new outfit. They want the original cosmetic features. They love the 4x4 tile bathrooms with matching mosaic flooring, both the metal and wood kitchen cabinets, the limestone fireplaces, the lighting fixtures that are almost impossible to find reproductions for replacement, the pine slatted walls and tons of natural light. These features produce a strong emotional connection to these homes. However, we are more likely to run into homes that have the design elements but have either been put through a horrible 80's or 90's renovation or have been recently updated for sale. I see it all the time! As I mentioned before, there are the time capsules (hard to find), the ones that have been recently updated (a more modern-day buyer is attracted to this) and those that have been caught in the no man's land of the 1980's or 1990's renovation. These are the ones we tend to see stay on the market the longest. However, if I can get a client to look at one, I can walk them through it and point out the original design features that are intact and how they can use resources I am aware of to retrovate the rest of the home back to the original spirit. (Ed: Yes, he said "retrovate". Totally descriptive.) Plus, how much passion and pride goes into taking something that has been trapped in a horrible cosmetic state and create a mid-century environment that you are proud to call home? It allows you to create the mid-century vibe you want and the end result is stunning. While from a different demographic, I do have a story. One set of clients last year always caught me taking pictures of mid-century aesthetics and items we would run across in homes I showed them. At one point, they asked me if I was taking the pictures for an ugly house blog. To their amazement, I explained that I actually love that style of design and that my Instagram has a great following, where I was posting the images. Cluing the non-enthusiast in that this market really does exist and it is stronger than they would think is always fun. To see someone look at me like I am a crazed maniac when I tell them, no you do not have to pull out the metal kitchen cabinets and pink bathroom to be able to sell your house, is always satisfying. There are many areas that appeal to me. The overall aesthetics of the time period are timeless classics. I wear vintage skinny ties every day, and I am always on the search for more that fit my style. My great-grandfather was a craftsman at Dunbar in Bern, IN. Dunbar is one of the more recognizable names of the time period. We have not only a coffee table he made from Dunbar materials, but we also recently acquired a Heywood-Wakefield dogbone dining set. Other than our family room furniture, every piece of furniture in our home is from 1950-1965ish. Then comes the cars. I can't think of a person who doesn't love the pieces of art that were automobiles in the 1950's and 1960's. If anyone has a 1957 Studebaker Golden Hawk, they would like to give to me; I would gladly accept! We do! We moved into a 1951 ranch last year that we purchased from the original owners. We are peeling away the many decades of "updates," to create our atomic ranch. The largest project so far has been restoring the original pine slatted walls. As I was doing the original round of demo on the home, I noticed that some of the walls were covered with paneling that was turned backward with wallpaper on top of it. With much fear and curiosity, I tore it down and found these gorgeous wood walls that have now been restored. It still has the original low voltage electric system and lots of features from a 1960's update. These projects have allowed us to create a list of great resources for mid-century items that we are happy to share with anyone who is retrovating a home. Many thanks to Sean Hayes of the Hayes Hometown Team with Coldwell Banker Premiere Group for being our first interview. Interested in working with Sean? You can find him here or on Instagram (stlmidcenturyrealtor) or Facebook (Hayeshometownteam).